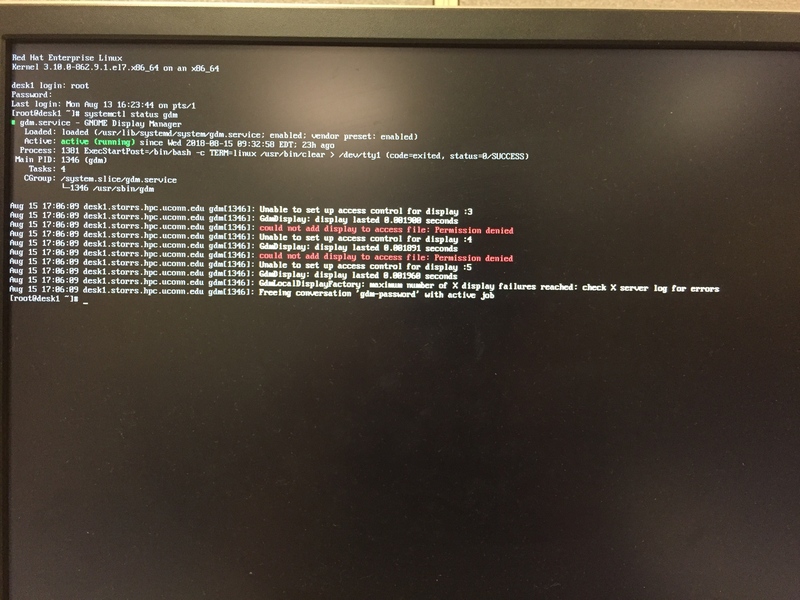 For some reason over the past week I've been having some issues with GDM on both my desktop at work (RHEL 7.5) and my workstation at home (CentOS 7). They are both two very different hardware configurations but are demonstrating identical symptoms and issues. For some reason after locking the desktop (Super + L or Lock button) trying to unlock will cause the password submit button to flicker at a very high frequency and the password field will clear itself while typing. This requires a power reset or dropping into a TTY shell and rebooting to solve. I checked the Xorg log in /var/log/Xorg.0.log but there wasn't anything that stuck out besides hundreds of AUDIT messages mentioning MIT_MAGIC_COOKIE connecting/disconnecting a lot. I've attached the log file just in case anyone can pick something up. This also required a reboot to resolve as restarting gdm would just break things further. Any pointers on this would be helpful! This is an XZ compressed log file, not just tar. Tar was added to allow uploading to the forum. GDM is a problem. I would suggest you switch your Display Manager to LightDM. LightDM gets around all the wonky AUDIT stuff. GDM is a runaway locomotive constantly filling up /var/log/Xorg.0.log file with repetitive AUDIT lines. GoTo a konsole => type su => Enter Secret Sauce Password and become root! With LightDM installed hopefully that will solve your problem.